Stavros is 16 km away from the city of Chania and offers you the chance to swim at the famous beach, where the movie 'Zorbas the Greek' was filmed and stretches in an almost circular manner rounded by rocks creating a somewhat amazing and breathtaking scenery that is really worth seeing even just once in your life. A tourist resort attracting annually visitors from all over the globe with two amazing beaches. The main beach with blue flag, white sand and turquoise water, lies at the foot of the mountain where was filmed the scene with Anthony Quinn, dancing the unforgettable Greek sirtaki and is worth visiting. Situated within a bay, this beach with crystal clear waters is ideal for windy days as you will find the sea really calm and you will make the most out of your stay. A perfectly organised beach with many comforts like sun beds, umbrellas, showers and lifeguards will get a big smile on your face. Once you are done swimming is the best time to enjoy a perfectly cooked meal since the area is full of restaurants and more traditional taverns serving all the local delicacies. 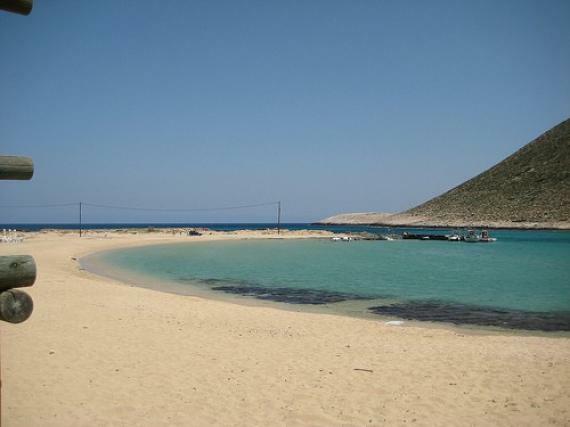 The picturesque harbor area is another place you can visit while the second beach of Stavros with thick Sand is located 300m west of the main beach and is also a wonderful choice that you have. This rocky beach with thick sand (Pachia Ammos)is also a perfectly organized beach with sun beds, umbrellas and many more comforts. Stavros is a resort area which is a top choice for family holidays in Crete as it can perfectly satisfy all family members needs. If you wish to spend quality time and relax with your family, then Stavros is one of the best choices that you have to do so. Relax by the sea with your family and friends while you are magnetized by the diverse and yet astonishing scenery of the area! Find information about selected Hotels, apartments and rooms in Stavros to choose the perfect place for your accommodation.